According to reports, an Australian engineer has built advanced robot, which can complete the home construction work in almost two hours by working whole day to build house for people. However; in traditional method humans needs to work six to eight hours daily for four to six weeks to construct the same building, besides availing holidays and holidays, the robot can work in much faster and accurate way without any breaks. Mark Pivac, an Australian engineer stated that the reason behind its development is that due to lack of workers, the average age of construction in industry is getting much higher and in an effort to help the industry our robots will be help to fill the game till some level. Worker have been laying the bricks for building from ancient time (6,000 years) and even after the industrial revolution, now we are trying to help the industry with automate the bricklaying process, stated Pivac. But after a lot of technological advancement we are still laying the brick by hand. Hadrian is able to complete the work by laying 1,000 bricks in one hour, and with this equation he will be able to put it up for 150 houses in a year. In overall process, first it needs a design of house and then it works out where all of the bricks need to go, before cutting and laying each of them. 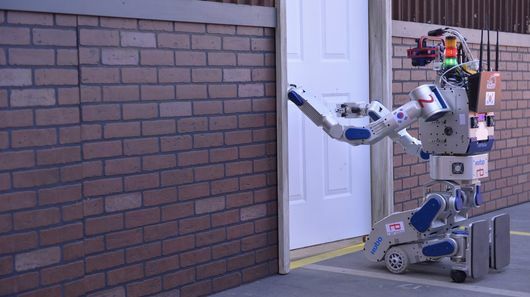 This robot has an arm of 28-foot, which is used o set and mortar the brick in all the process of laying the bricks robot doesn’t need to move. Now Pivac is working on the commercialize the robot, which will one of its first kinds globally.